The Boyne Valley is situated in the east of Ireland. It’s sites and monuments are amongst the best examples of their kind in Europe and are all within a short distance of each other. This region is one of the key attractions of the ‘Ireland’s Ancient East’ initiative promoted by Tourism Ireland, and with such rich cultural and historic sites, the team responsible for the promotion of this region saw the need for the delivery of a mobile tourism-focused guide which promotes the unique beauty and diverse cultural attributes of this area. 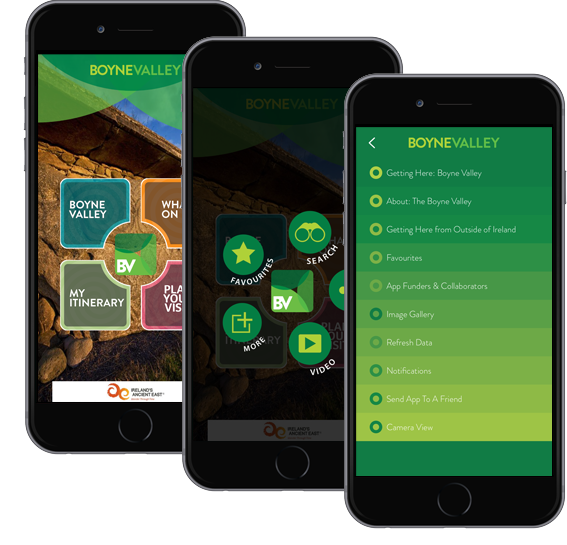 The App was designed to provide real-time, relevant information on the amenities and cultural attractions that the Boyne Valley has to offer. The solution provides the perfect tool to promote and profile the unique beauty and cultural value of this location. The solution is driven by a web based Content Management System, which allows the client to update on demand all of the content and launch and/or amend promotional activity. With a suite of digital marketing tools, the client is empowered to fuel economic growth and breath new life into the area by connecting and engaging with the visitor.